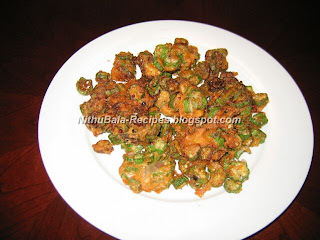 Bhindi pakora is very easy to prepare. It take less than 30 minutes for the whole procedure. This is a delicious evening snack. My mom often prepares this crispy pakora at home and she gave me this recipe. 1.Wash bhindi.Cut in to small round pieces. 2.Take cut bhindi in a bowl and then add rice flour,redchilli powder and salt. 4.Mix them all well so that the bhindi pieces get equally coated with rice flour,chilli powder and salt. 5.Meanwhile, heat oil in a pan and in batches,deep fry the bhindi. 6.Drain excess oil on a Kitchen tissue. Note: If you want,you can also use gram flour 1/4 cup and 3/4 cup rice flour instead of 1 whole cup of rice flour alone.